Joe’s Top 25 Space Movies!! A 20th century astronaut emerges out of 500 years of suspended animation into a future time to become Earth's greatest hero. After the destruction of the Twelve Colonies of Mankind, the last major fighter carrier leads a makeshift fugitive fleet in a desperate search for the legendary planet Earth. After the destruction of the Twelve Colonies of Mankind, the last major fighter carrier leads a makeshift fugitive fleet on a desperate search for the legendary planet Earth. Running low on fuel, the Battlestar Galactica receives the help of the supposedly lost Battlestar Pegasus which is taking the offensive with the Cylons. After an astronaut and test pilot is catastrophically mutilated in a test plane crash, he is rebuilt and equipped with nuclear powered bionic limbs and implants. When the Battlestar Galactica finally arrives at Earth, they find they must subtly raise its tech level while protecting it from the Cylons. In a futuristic society where reaching the age of 30 is a death sentence, a rebellious law enforcement agent goes on the run in search of Sanctuary. A year after Liberation Day, courtesy of the red-dust bacteria, the humanoid, lizard-like aliens develop a resistance to the micro-organism and try to regain control of the Earth--only now some humans are knowingly working with them. A small group of human resistance fighters fight a desperate guerilla war against the genocidal extra-terrestrials who dominate Earth. The crew of Moonbase Alpha must struggle to survive when a massive explosion throws the Moon from orbit into deep space. When aliens come to Earth to ask for our help, a few suspicious humans discover their horrific true intentions and prepare to resist. After a severely injured test pilot is rebuilt with nuclear powered limbs and implants, he serves as an intelligence agent. The original space man! The ultimate trip! Buck Rogers swings back to earth and lays it on the 25th Century! It's important to realize there are actually two versions of this film. The first was the Theatrical Release, which had a few well-placed Hells and Damns, as well as a painful kick in Duke Butler(Tigerman)'s testicles during the obligatory he-man fight scene. There is also a special-effects bonanza near the end of the film, when a hologram from the Draconian Warlord appears to chastise Kane (Henry Silva) for launching the attack (and failing!) before his arrival. All of these aforementioned scenes were cut out in the TV Release, to make room for commercials, and to appease network censors. Regrettable, but these things happen. But it was the TV Release which became the commercially-released video-tape! This is a major production goof, and it reveals the studio's utter contempt for the audience! If they didn't care enough to release the better version, or even bother to see which one they had in their hands, then they obviously don't think much of those who would pay to see it! Sadly, such an attitude only hurts the studio's image when looking at the video. 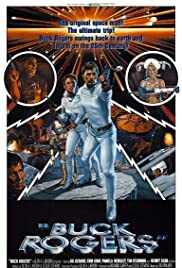 From Gil Gerard's obviously doctored speech, to the suddenly paralyzed state of Tigerman, one cannot escape the sense that this was not a work of love, but something created to pad a few pockets and fill a network time-slot. Feeding time for the animals, in the studio's eyes! What a way to treat "The Original Space Man"!